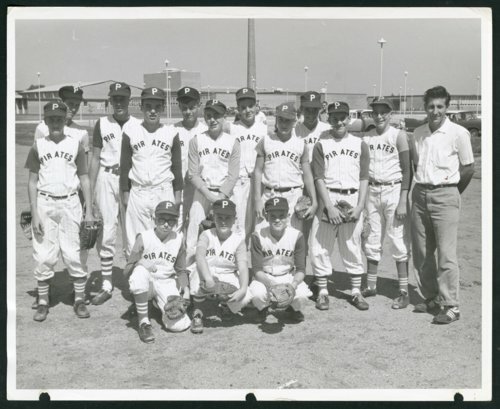 This photograph from the early 1960s is of the Boulevard Plaza Pirates, a youth baseball team sponsored by the Boulevard Plaza Shopping Center in Wichita, Kansas. Standing in the back row are (l to r): Jim Peebler; Bill Caperton; B. Herron; John Brady; Bob Cox; Mike Rozelle; and Richard Hylton (manager). In the middle row standing are (l to r): Danny Kipp; Gary Grey; Steve Berndsen; Gary Kerns; and Rod Goldinger. Kneeling in front are (l to r): unknown; Mike Hylton; and Larry Schaar. The photograph was taken at the practice field of the Southeast High School in Wichita. The school complex is shown in the background.